Upscale Pottery Barn beach decor welcomes you in this upper two-bed, one-bath unit across the street from the sand! Recent remodeling includes a brand new bath, new flooring, paint and furnishings. Settle into the comfortable chairs on the brand new patio area while you watch the waves by day or sunset at dusk. There is a bistro table and seating on the ocean-view balcony, a BBQ in a private area off the kitchen, multi-station cable DVR in the living room with high-beamed ceilings, & lots of light. 2 Queen beds: one bedroom has an ocean peek; the other is private & comfy with an outside entrance. Sofa is a queen pull-out sleeper; plus two 'air' beds (twin) also available for 'extras.' Pack n Play available for small infant (up to 1 year). The kitchen provides everything needed to make a quick snack or complete gourmet feast, including an espresso-maker. Ocean view dining room table for 4 expands to 8. On-site garage parking for 1 medium-sized or smaller vehicle with washer & dryer available. Beach Bungalow includes 4 bikes, beach chairs, a 'soft' surfboard & several boogie boards for experiencing Manhattan Beach to the fullest. You'll enjoy the short 4-block stroll along The Strand into town where you'll find a fabulous selection of coffee bars, restaurants and one-of-a-kind boutiques. 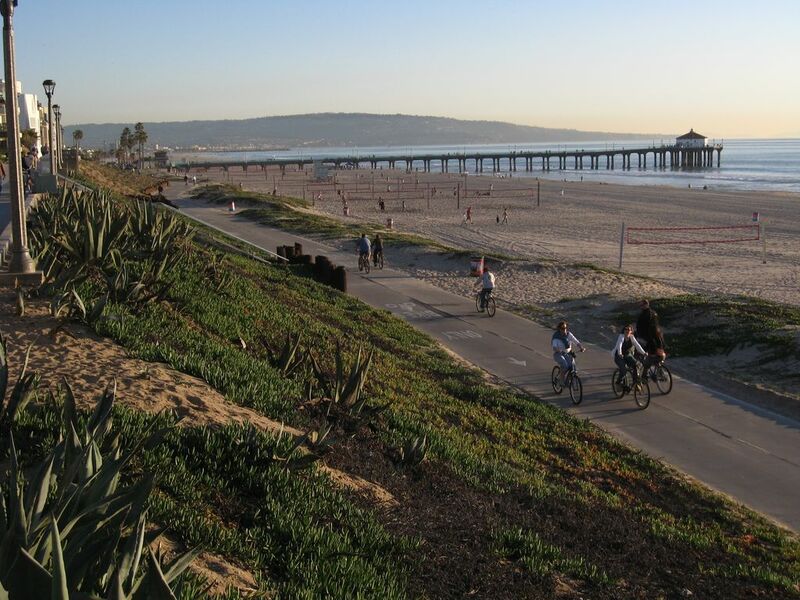 Experience the Manhattan Beach lifestyle! Please CALL our property managers at Marine View Vacation Rentals (310-373-3599) with any questions or to book your stay as this unit often fills up faster than we can update our calendar. 1 door off the water! Single car garage with opener; works better for smaller vehicles. Fully stock kitchen for cooking/entertaining. Expandable dining table seats 6 comfortably. 3 beach cruisers with helmets provided. Small deck off entry with ocean view. boogie boards, soft surfboard provided. Small stroller available (stored in Master) for 2-6 mo old child. Portable crib for up to 1 yr old. Every have another rental in Manhattan Beach and I was born and raised there. So happy our guests had a great experience in our sweet Beach Bungalow! As noted in our listing we provide parking in a secure garage for one standard sized vehicle. Parking in downtown Manhattan can often be busy; fortunately this rental is located only 6 short blocks from downtown and it is pretty nice to stroll along the Strand for groceries or a great meal. More parking structures in the downtown areas have been constructed over the past few years -- it just takes scouting around a bit to learn where those are located so as to take advantage of the often available parking spots in them! We love staying at your home! Perfect location, great restaurants, well appointed and all around amazing! See you next summer! Perfect spot with all the amenities. Well appointed, comfortable. . .and quiet at night. We stayed for 2 1/2 months and would definitely like come back. The home is in an excellent location and they mean it when they advertise the close proximity of the beach. Staying that close made a real difference to us, who were there with our 1 year old and 3 year old and didn't want to haul beach toys very far. The beds are comfy and the kitchen has everything you need to cook meals "at home." There is not a washer/dryer so plan accordingly. What stood out to us was also the quick turnaround from the property management company. We booked our trip on short notice and they were extremely professional and responsive. They worked with us on details of travel and gave us great advise (i.e. rent a car small enough to fit in the garage, there was a pack-n-play already at the house). We also spilled something on the sofa and they helped us get through the process of replacing that with minimal cost and handled it entirely in 2 emails. There is also a very kind gentleman that lives downstairs. We had little kids running around and were worried they may be making noise early in the morning. It was great to have a friendly neighbor for the 4 days we stayed. Location, Location, Location! Yes, this intimate beach bungalow is in the perfect location just a five minute walk to the downtown. The beach is wide and beautiful without ever feeling as though you are cramped up against your neighbor. The garage is stocked with beach chairs, umbrellas, surf board and 3 bikes so pack light when you come. Beds are comfortable, bathroom and kitchen are sparkling clean. Fall is a beautiful time to come. The weather is still very nice and the crowds have all departed for the summer. I love coming here and want to make this my annual trip. I have been to many beaches in Southern California and Manhattan Beach is by far my favorite! My favorite part about this beach house is everything! I've rented something near the beach every summer and this is by far is our favorite. The location is key. We walk everywhere and the bikes provided are a real plus. Usually you'd spend $5+/hr The house is clean, bright and comfy. Perfect for a Girls Getaway, a small family or 2 couples. Management company and owner are easy to work with and go above and beyond to make stay perfect. Located just steps from the beach and 4 short blocks from downtown Manhattan Beach with a variety of dining and local shops. Other Activities: Beach activities galore! Body and board surfing, stand-up paddling. Bike and running trails. Shopping, Boating, Health/Beauty Spas. Tennis and basketball courts 4 blocks east. Golf within a 10 minute drive. LA culture! SNOW BIRDS ~ Special rate for a 60 day or longer booking during October - January. $4800/m. Inquire for shorter term rates **** Rates subject to seasonal periods - may change without notice. Pricing excludes taxes, additional options. Property Damage Protection add'tl - $45 (coverage up to $3,000). Stays 1 month or more require mid-stay cleaning @ $85. SPECIAL LONGER TERM RATES ARE AVAILABLE FOR A BOOKING OF 8-12 WEEKS during non-peak seasons.